Our etched golfing mirror make a great golf themed gift. They can be customized with your text. 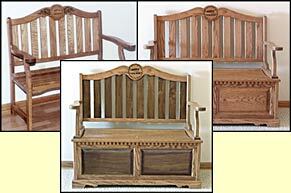 We also have clocks, benches, and mirrors come in oak, walnut, or cherry, other woods available by special order. The clocks come in different sizes and can have an etched wood or glass panel personalized with your name. Choose wood type, stain, and face. 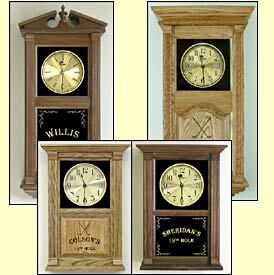 The wall clocks have two styles of tops and bottoms to choose from, colonial or traditional and can be mixed. The smaller clock can stand or be hung on the wall. To order or for more information click on Custom Etched Golf Clocks. A personalized golf clock makes a unique gift for your favorite golfer.